just lay out the pattern you will be tracing and identify which lines you will actually be tracing. I use the white gift wrapping tissue paper that I buy every year at Costco. It may not be the recommended, but it works for me. I usually have more that I will ever use. I seem to buy it every year, sometimes twice. It lets me make tons of tracing without feeling like it costs anything. I also just use a pencil. I prefer a mechanical because a wooden one always seems to break or get dull in the middle of tracing. With the mechanical, I can just click for more lead. I usually just steal borrow one from my kids. Once I figure out which lines I will be tracing I place the tissue paper on top and smooth the two together. Sometimes, I will use painters tape to tape the corners to avoid movement. It isn't always necessary. This time, I was a maverick and just started tracing. While tracing, I make sure to get the grainline and any other additional markings that will aid in placement. I also put the pattern piece number. I also like to put the size, the Magazine or pattern, and anything else that I might want to refer to now or in the future. Once everything is traced, the original goes back into the magazine. I really hate it when I look through one of my sewing pattern magazines and the pattern is gone. Next, I cut the pattern and layout the pattern. 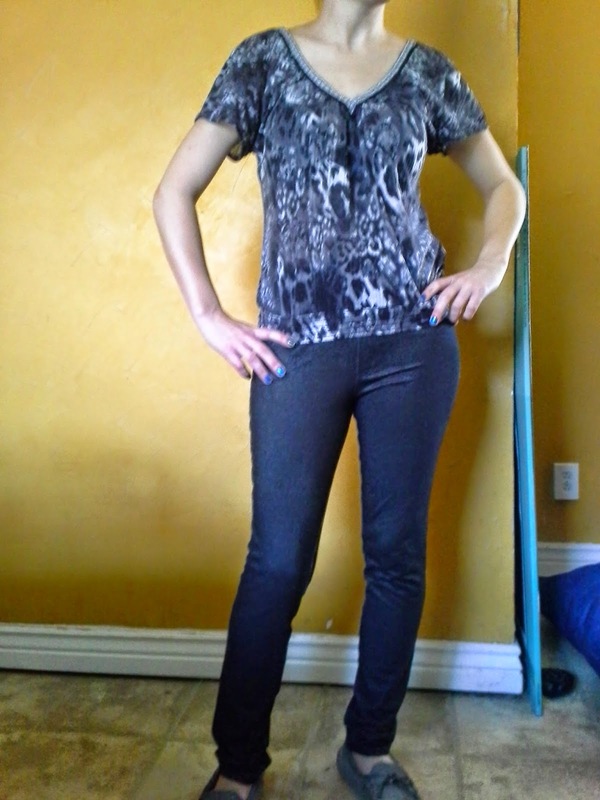 Jeggings are the result when jeans and leggings are mixed together. I was able to find a cotton, lycra knit blend that really looks like denim. In fact, this is has the lighter background thread and the rest are black. The knit weave even looks like the diagonal twill in denim. For the unsuspecting person, it looks like denim. The real purpose of jeggings is comfort. They are snug and cozy. No waistband--well, it there is an elastic band. There are real back pockets and even a real coin pocket, but the front pockets and fly are just topstiched. This is a great pattern for those afraid of the front pockets and zipper fly. I used my serger to sew the seams and topstitched each line separately on my regular machine. No coverstitch today. 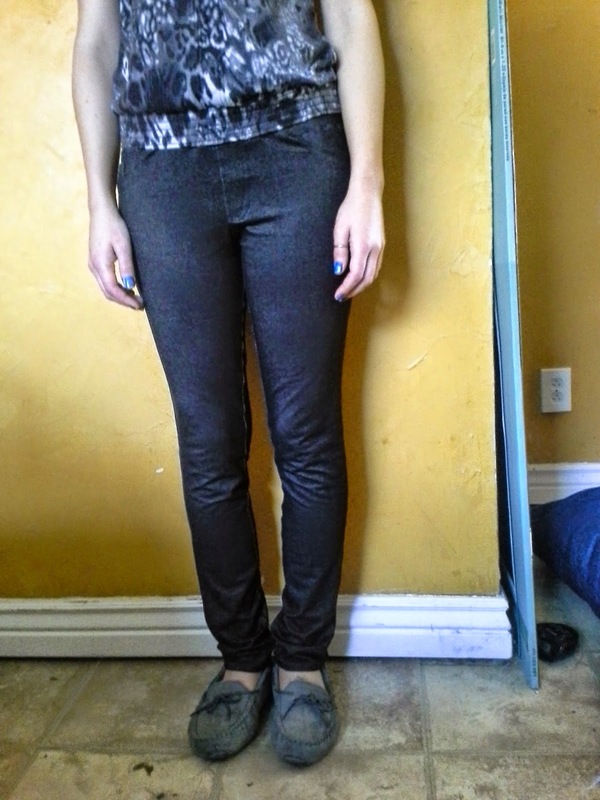 Once I was finished assembling, I tried on the most awesome jeggings I had ever seen. So comfy, better than a pair of sweats. Unfortunately, these wonderful form fitting jeggings are just that. Form fitting. Way to form fitting. There is no way at my age as a mom of four could possibly go out in public it one of my favorite makes. Luckily, I have a 24 year-old daughter who looks great in jeggings. They are even a little more age appropriate. UPDATE: My daughter has worn and washed these multiple times a week. They have worn very well. Of her three pairs, this is the one worn most and unlike the others, has not worn out. I may need to make her another pair the next size down since she has lost a little weight and I have a bunch more of the denim knit. So sad they didn't work out for you but they are really cute on your daughter. Thanks so much for the Costco tissue pattern tip. I use Swedish Tracing pattern but am kinda stingy with it. I have been trying to find something to use until I know if the pattern is a repeater or not! I have a variety of materials for tracing. I find that the plain white tissue is great because I don't worry about rationing it. 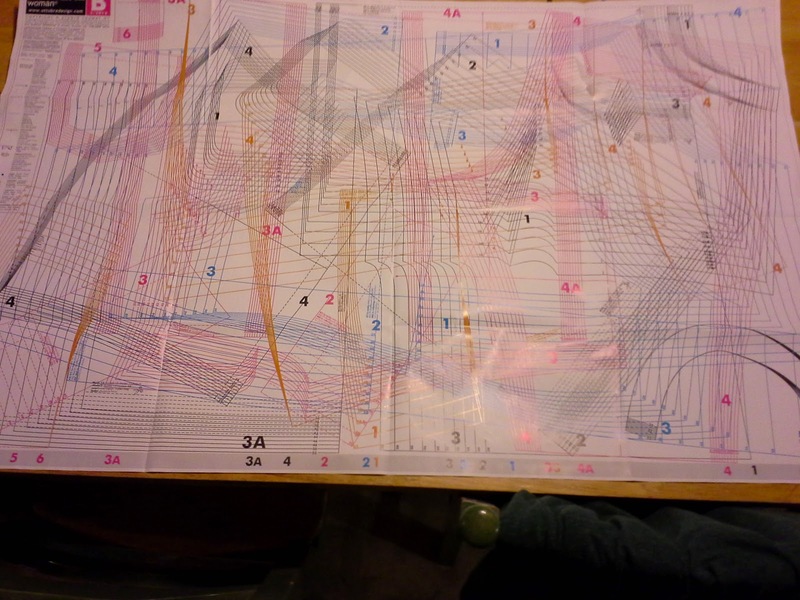 It is also not too difficult to see through for tracing. I actually have been able to reuse the tissue patterns several times if I'm careful. Despite not liking them, I think they turned out great and glad your daughter likes them. I use tracing paper from the art section at the craft store -- I always pick it up with a coupon!